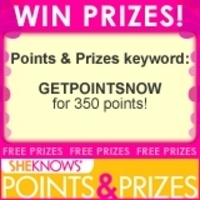 SheKnows.com, one of the fastest growing online destinations for women, and PointsandPrizes, a contest site where members earn and collect points by finding keywords located across the internet, announced it will be offering Visa CASH Gift Cards to members. During this touch economic climate, PointsAndPrizes.com members will now have the opportunity to use their points towards $100 and $50 Visa CASH Gift Cards! Best of all, members earn points while doing something they do every day - browse the web! PointsandPrizes.com -- How do you get points and win cash? Not a member? Simply log on to PointsandPrizes Home Page to get started! That's it! No credit cards ever needed, no gimmicks, no strings, no cost to you! You can start collecting points while browsing SheKnows and the various partner websites as soon as you become a member. The opportunities are endless and include the following: Monthly Hunts, Weekly Words, Newsletters and Giveaways. PointAndPrizes.com is a contest website where its members browse around multiple partner websites including SheKnows in search of different words and earn and collect points. Members can redeem their points for cool prizes such as: DVDs, CDs, Wii's, games, baby gear, accessories, women's clothes, perfume, furniture, books, toys, beauty products and much more! PointsandPrizes has over 50,000 members and is growing everyday! Advertisers looking to get their products in front of a female-centric audience can contact us to discuss how we can promote their products on our site for 60 days for free. Other websites, looking to build traffic and reach our 24 million unique visitors each month can contact us to find out how to become a part of PointsandPrizes. Getting to the heart of what it really means to be a woman, SheKnows.com attracts more than 24 million unique visitors. With editors dedicated to providing daily content for women seeking advice, information and a fresh fun take on life, the site is the authoritative source for women ages 18 to 54. The SheKnows audience gains access to exclusive content on entertainment, parenting, health and wellness, money and career, dating, beauty and style and more, and are offered a stimulating, well-rounded online experience enhanced with a vibrant message board community, free games and activities, and captivating blogs. As one of the fastest growing destinations on the web, SheKnows is consistently one of the top 10 properties for women, generating over 150 million page views each month. For advertisers, opportunities for sponsorship and creative integration go well beyond the banner and make marketing messages an uninterrupted part of the user experience. The company is based in Los Angeles with offices in New York, Scottsdale and Chicago. SheKnows is part of Atomic Online, a diversified online media company.